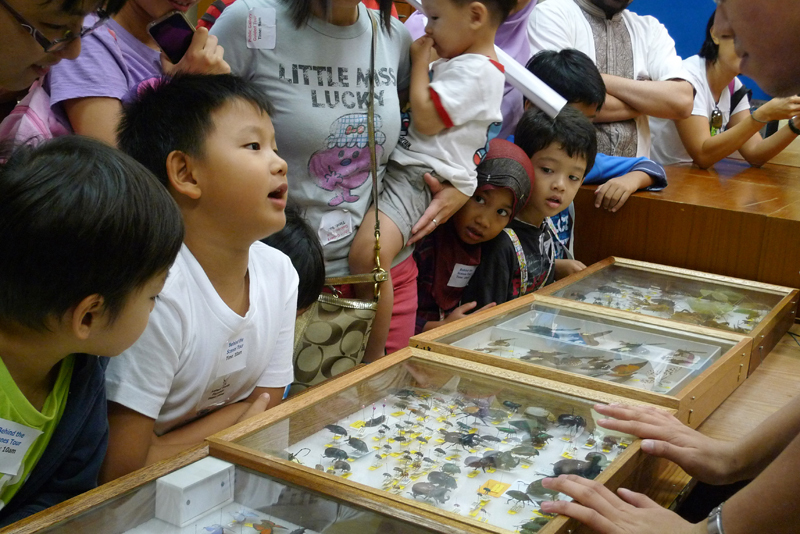 Today is the Raffles Museum of Biodiversity open house 2012. 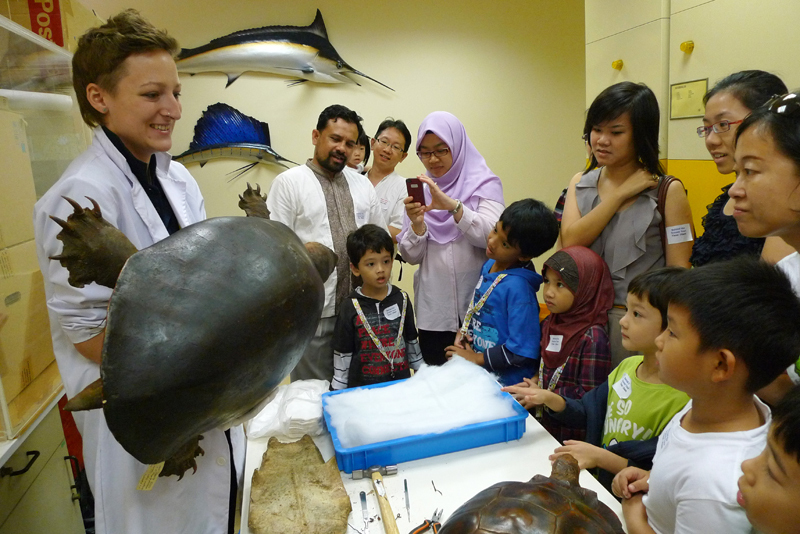 Today's open house is one of the many programs from the National Heritage Board's Children Season 2012, a series of various museum programs for children to enjoy the fun of visiting the museum. I reached the museum as early as 09:15 and a small quiet crowd was already going through their public gallery guided walk. I went to register for my 10:00 behind-the-scene guided walk. It was a slow long wait. Nearing 10:00, the crowded started to arrive slowly. The level 3 lift lobby was starting to get crowded. 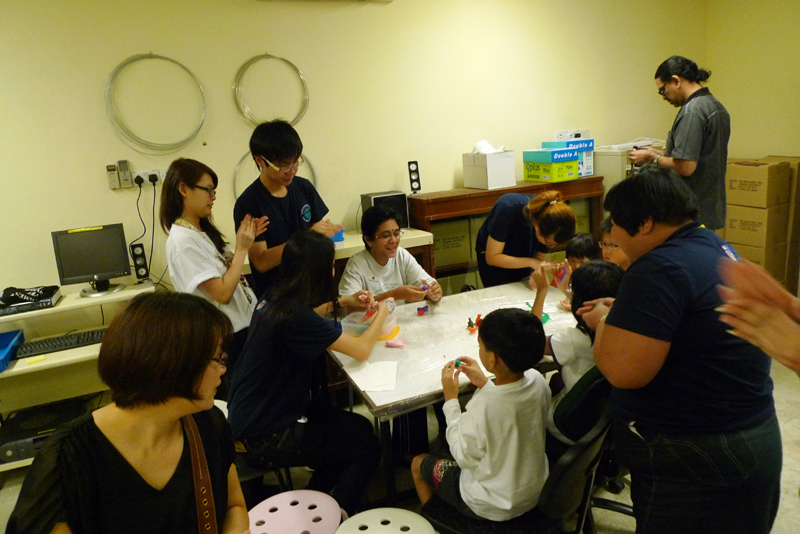 So was the corridor leading to the museum as the various activity booths were being setup (masking making, face painting and mini excavation). The participants gathered around the RMBR volunteer holding the signage to "Behind-the-scene". 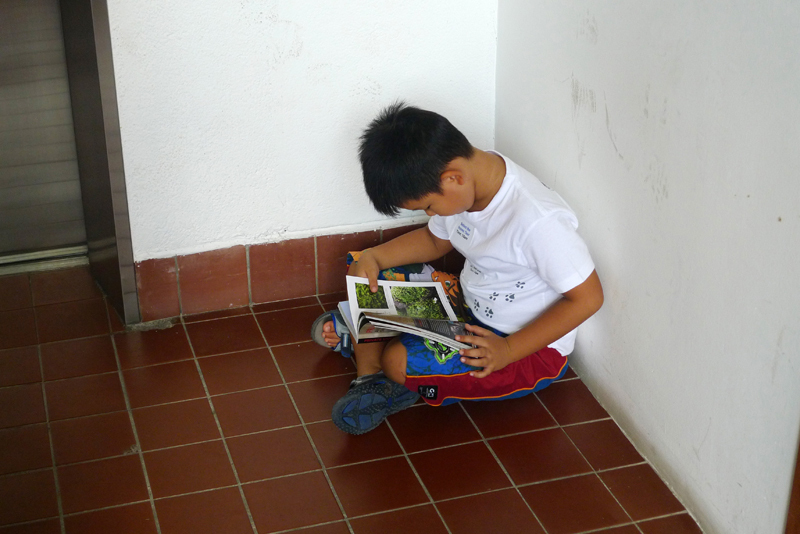 One of the children participants bought the book "Private Lives: An Expose of Singapore's Mangroves" and he was so eager to read about it. 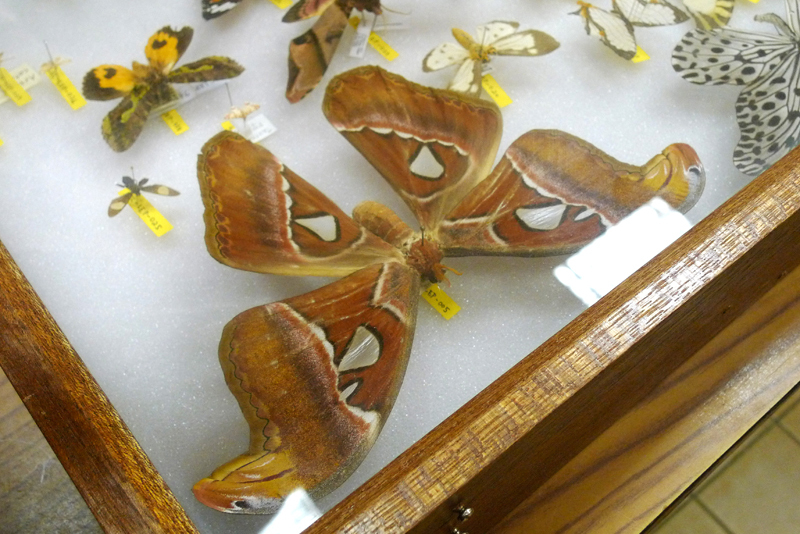 Shortly past 10:00, the group was lead to through a door in the museum and we entered the specimen collection area. This tour brings participants to a special area of the RMBR that is out of bounds to public on normal museum opening hours. This place houses the rest of the speciemens not in display in the museum. 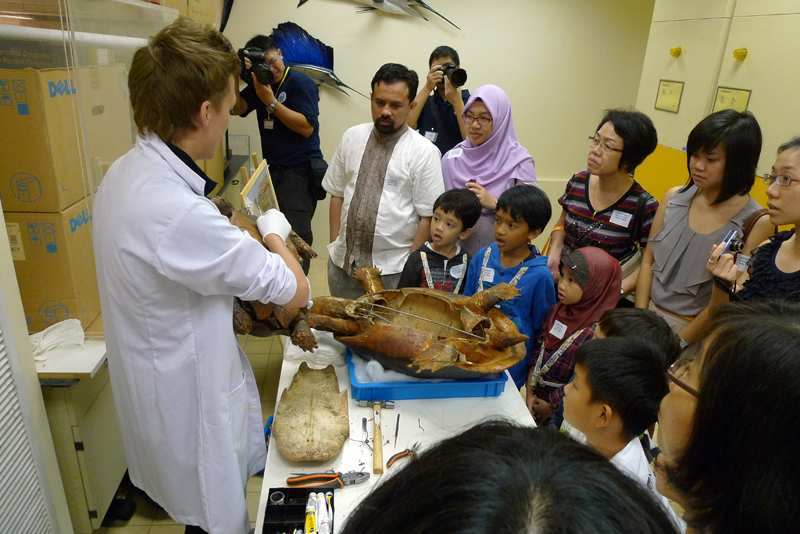 The first station is the dry specimen on birds. 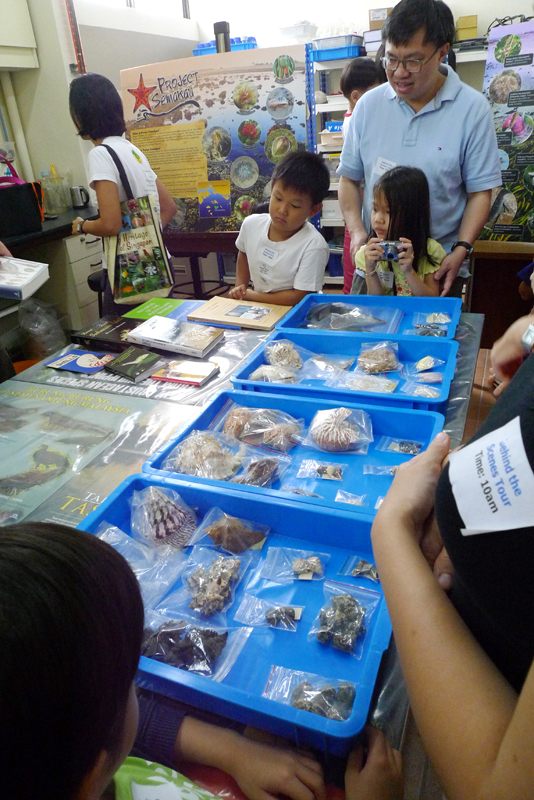 The volunteer told us that the birds are preserved with only their skin and feathers. They have to carefully slice a opening along the bird's breast. The muscle must not be cut so as to prevent any bleeding. 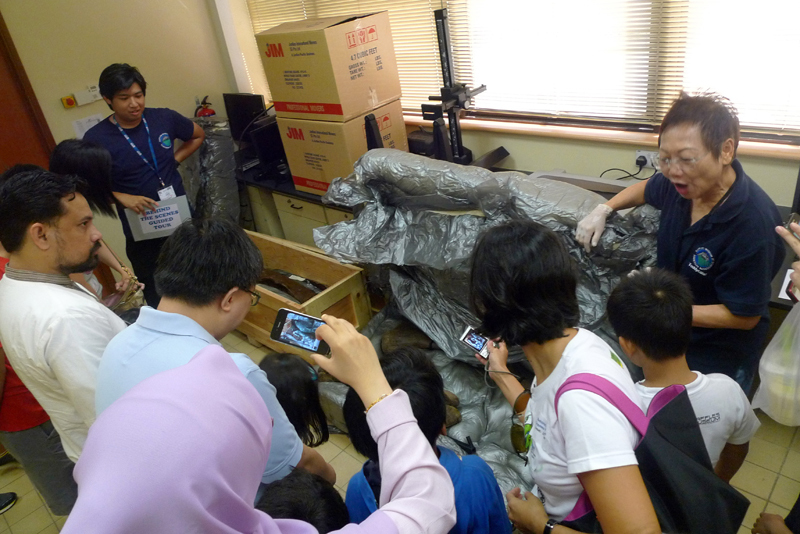 She then showed us how the bird is kept in "kachang-puteh" wrappers (newspaper rolled up to a cone) when doing fieldwork. 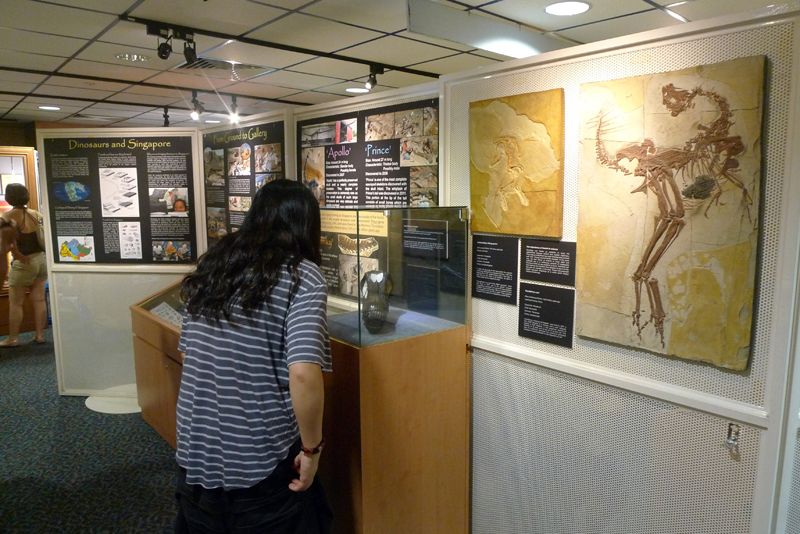 The group also took a look at the dinosaur bones at are kept in this room. 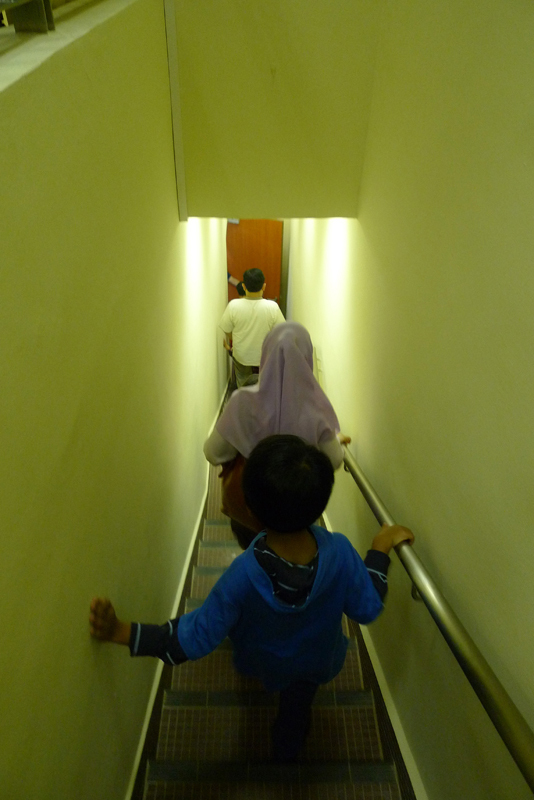 The second station brings us down the narrow and steep staircase into the insect room. Here we see the butterflies, beattles, bees and many other insects. 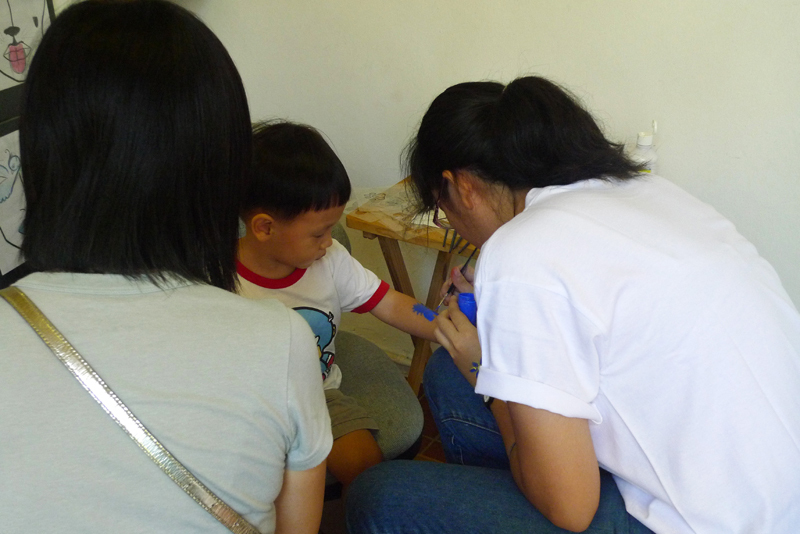 Children are great participants as they are very observant and they ask all sorts of questions. They also like to tell and share with everyone what they know. A child sharing some comments. 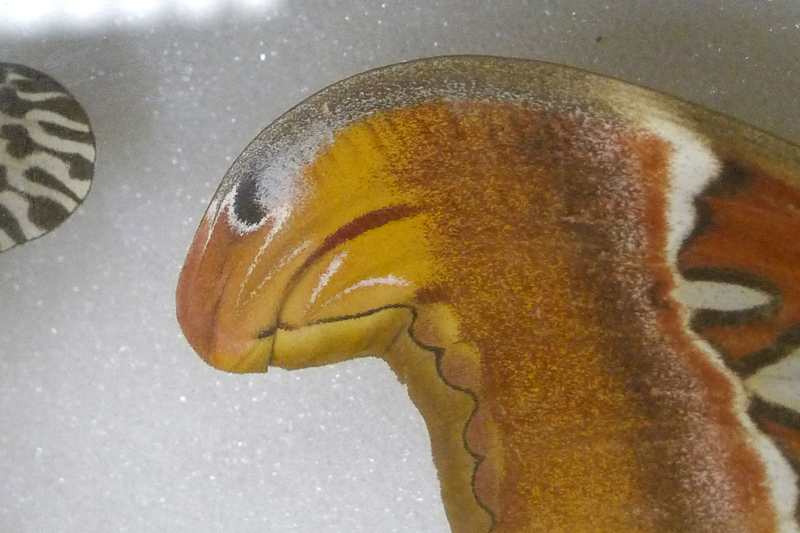 I learnt that the wing tip of the Atlas Moth has a pattern that looks like the head of a snake. 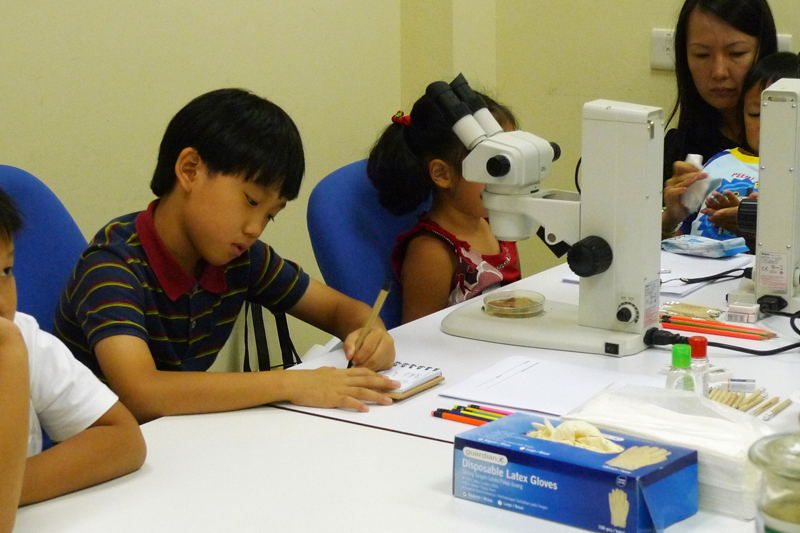 Next is the molluscs station where we saw a few specimens collected from Semakau. The station guide told us that the scallops meat we eat are mostly fan clams. We usually eat the muscles of clams but actually the other parts in the clam can be eaten too. 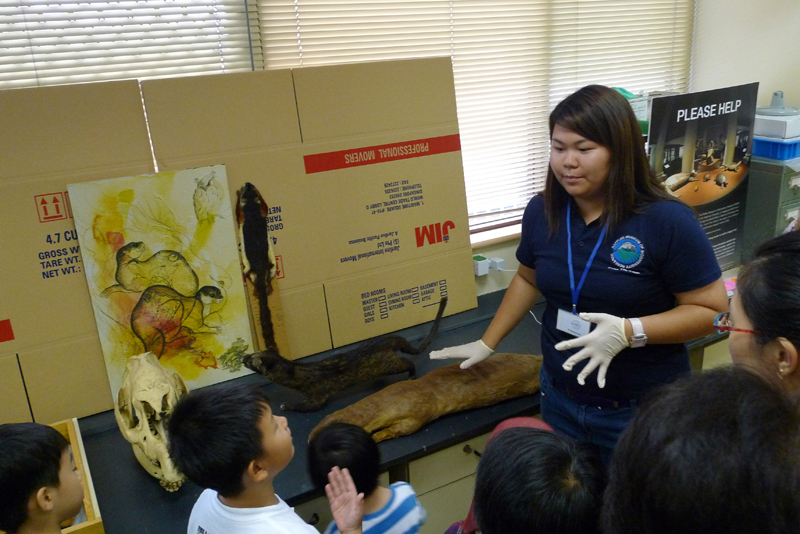 Then we went back up the same steep, narrow staircase to visit the mannmoth collection where we saw the tiger skin, the skull of tapir, the plantain squirrel, smooth coated otter and the palm civet cat. 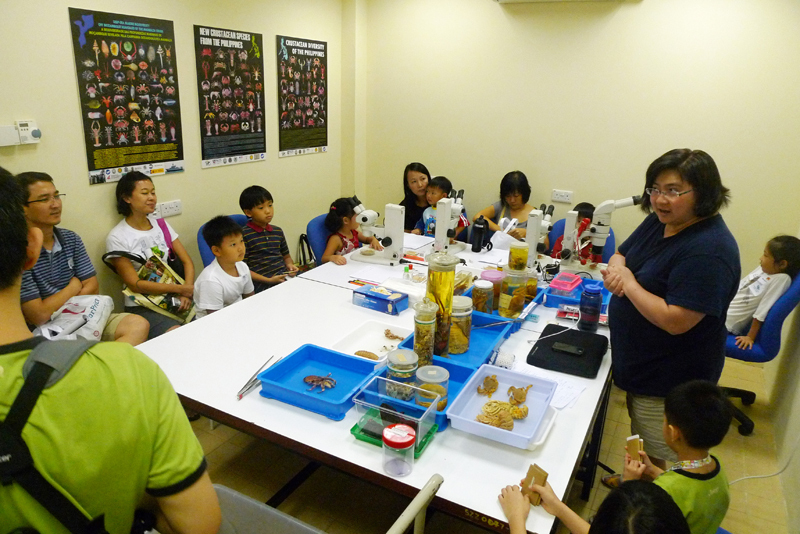 Our final stop is the specimen conservation and restoration station. 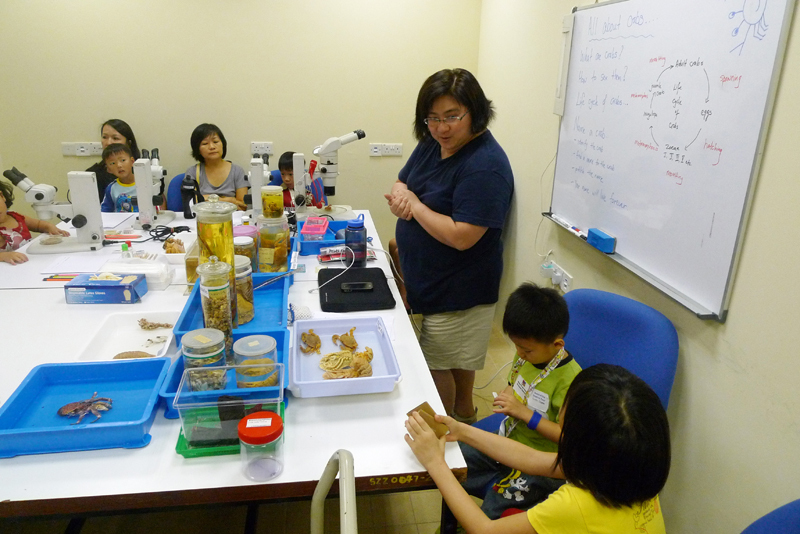 Kate was at the station restoring a turtle specimen. 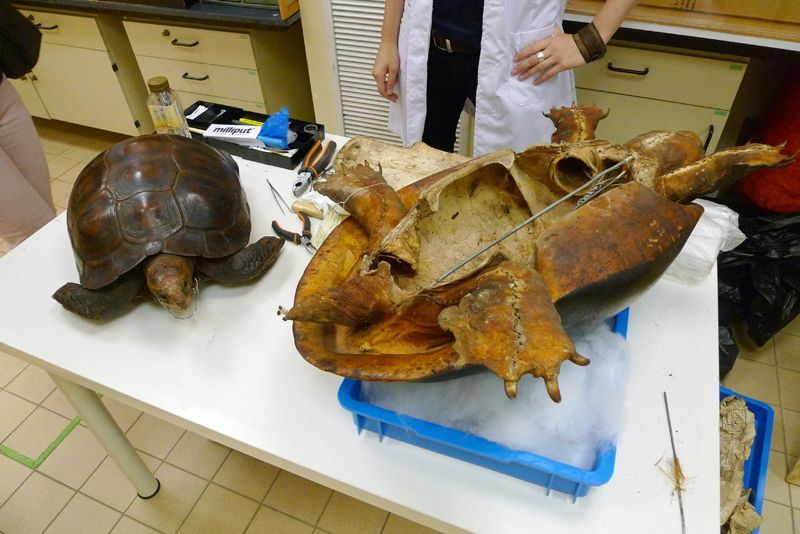 She pointed out that she found very old newspaper when restoring the turtle on the right. 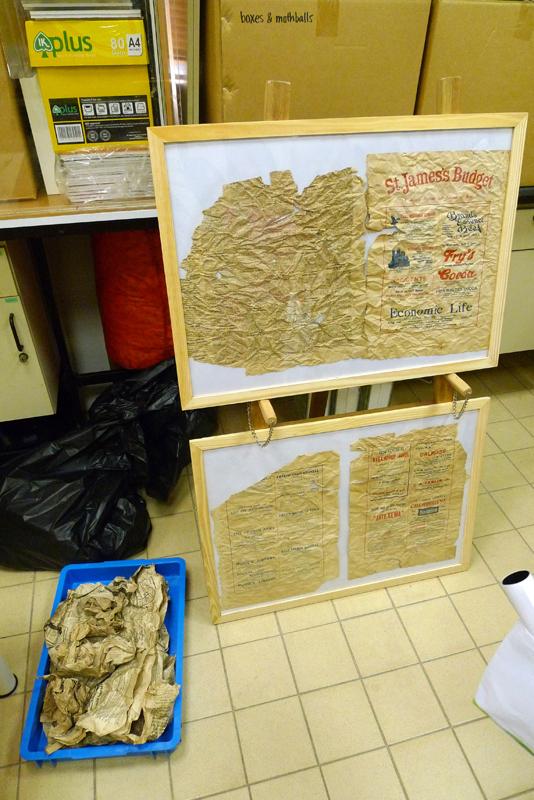 Restoration of the specimens are important to remove rusting wires, conduct patch works, colour restoration and cleaning the interior of the dry specimen. This job requires many disciplines such as biology, art, dentistry, sculpturing as the restorer has to replace the missing parts and perform touch ups to the specimens. Kate showing the shell of the turtle she is working at. The newspaper used to stuff the complete turtle. With that, we end our guided tour in 1 hour. After that, I went to the registration booth to find that there are spaces for the crabs workshop at 12:00 and so I signed up for it. 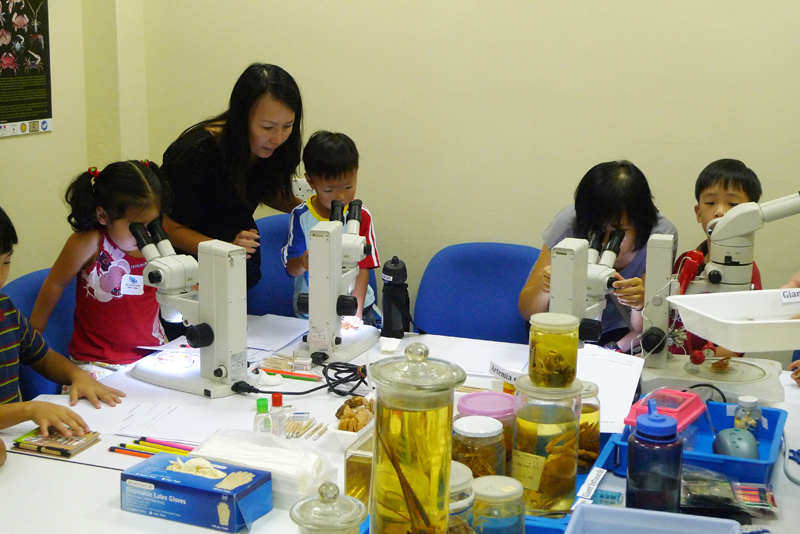 The crab workshop was held in a cosy small room located somewhere behind the museum. On the table, there are live and dead displays of crustacean specimen. The first organism that caught me was the coconut crab from Chirstmas Island. 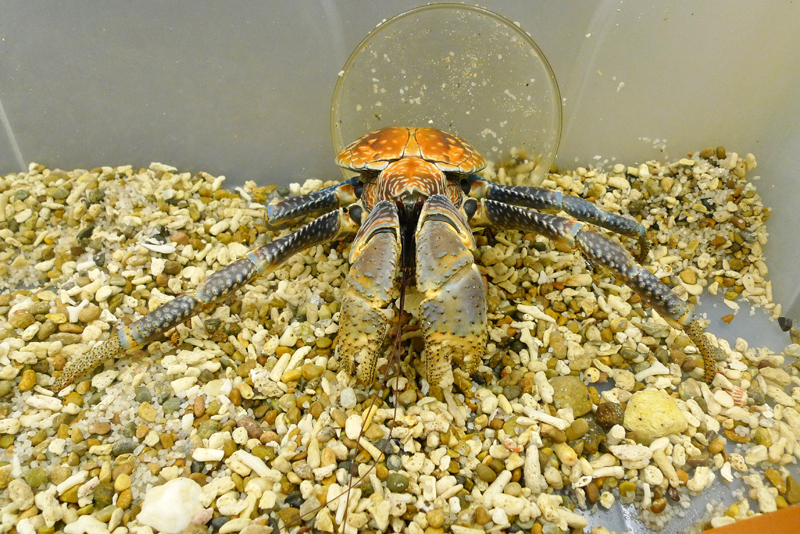 It is a very fierce crab and its pincers are capable of snapping finger bones. 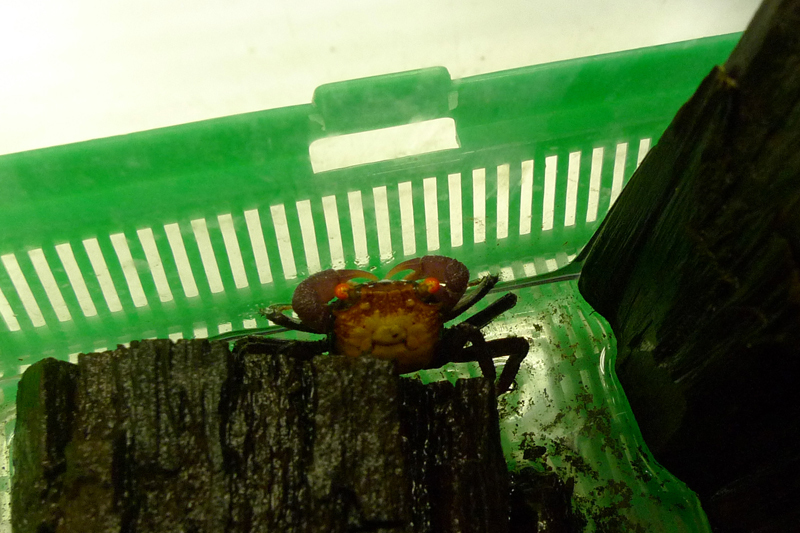 There was also the vampire crabs on display. The crab is known as vampire crab because of its red eyes. 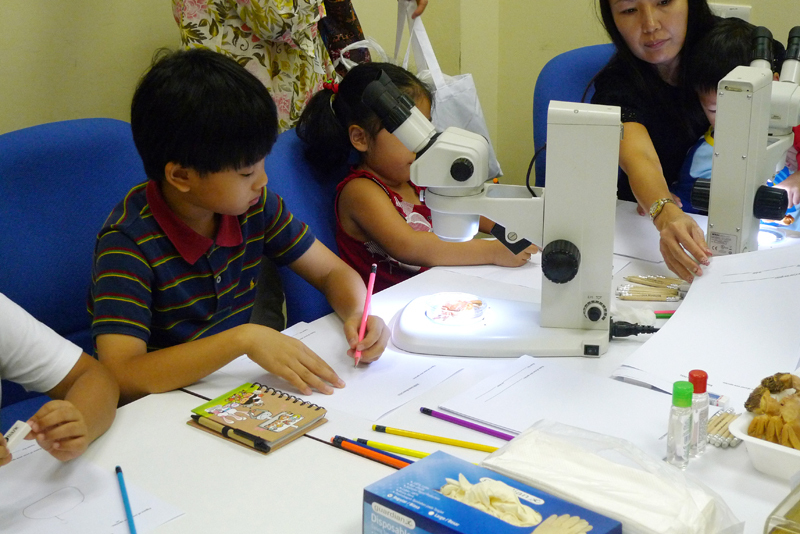 At the crab workshop, we learnt how to identify the gender of crabs, the survival of baby crabs and we were introduced to some of the common crabs, prawns and shrimps. 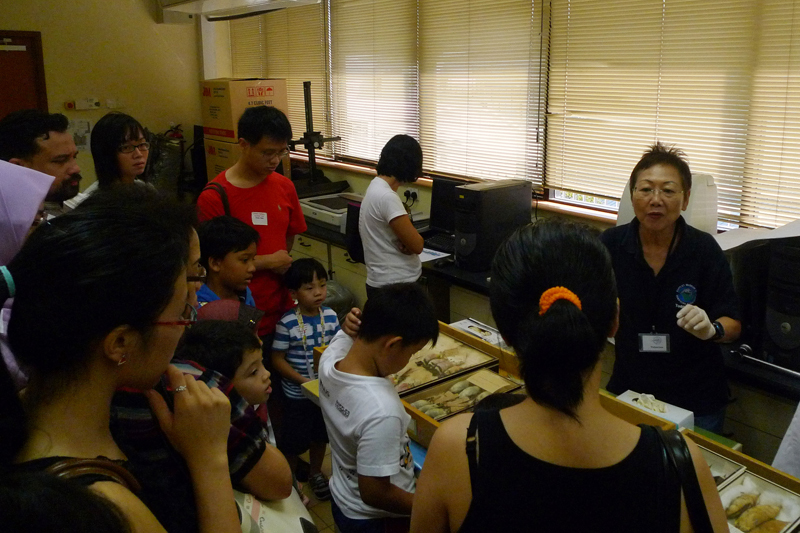 Packed room for the crab workshop with many specimens on display. Specimens were being passed around to allow the participants a better view. Some participant was very attentive and taking down notes. That's a very curious child. 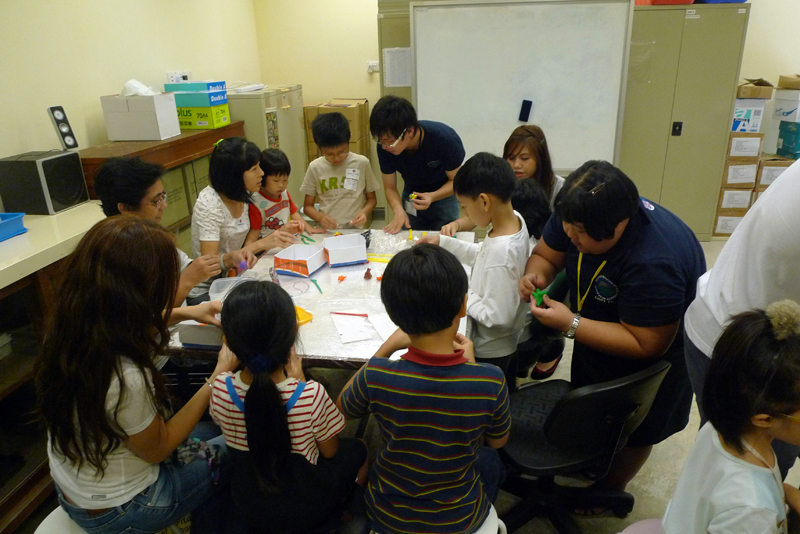 The workshop ended with children activity. 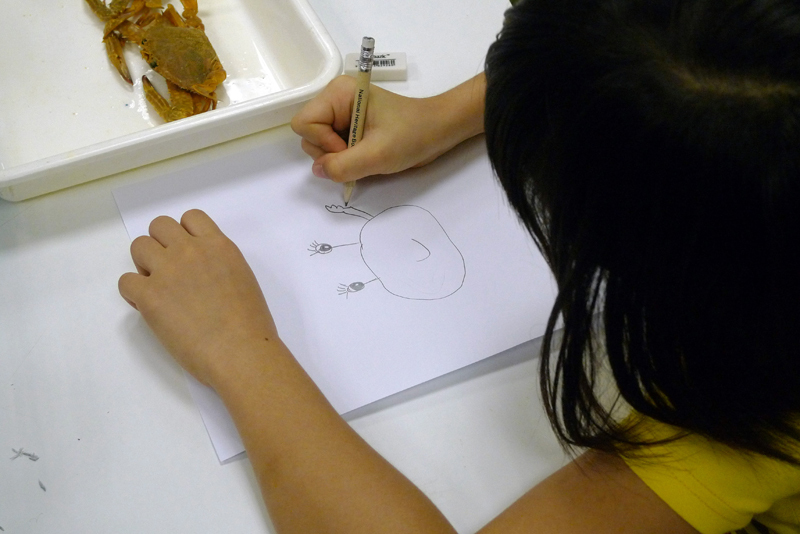 The children were tasked to draw an image of a crab. 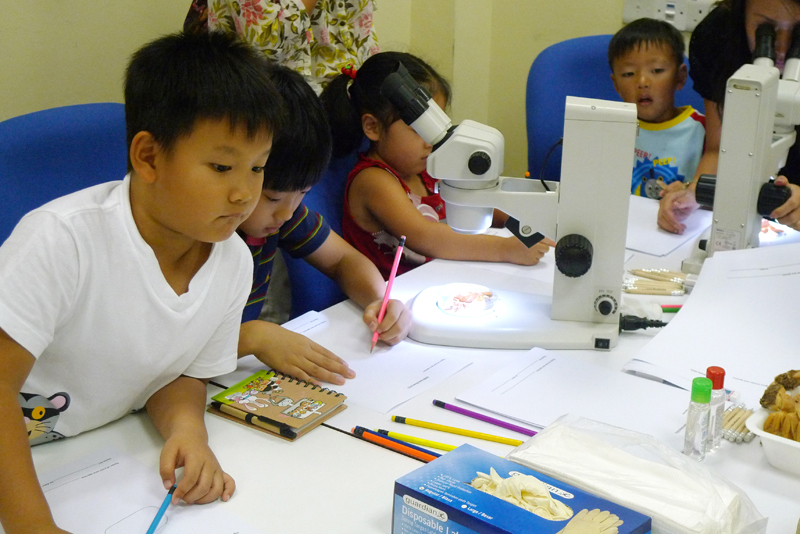 They can look through the microscope to look at the details to help them in their drawing or they can draw by simple observations. The children can name their own crab drawing and they get a magnet in return for their effort. 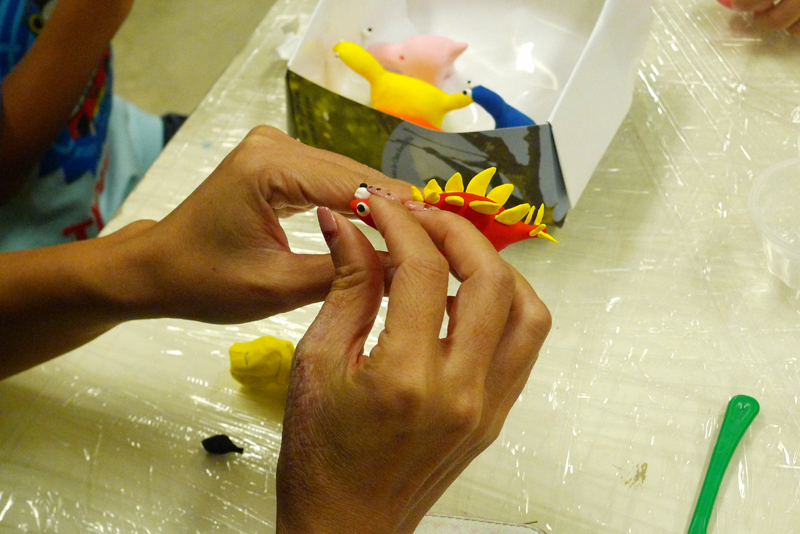 At 15:00, it was time for the animal pottery workshop! At the animal pottery, it was full of children. I was the only big children there (daddies and mummies not counted). One of the volunteers told me that someone wants her to say "Hi" to me but she forgot the person's name. I was in the animal pottery room early as most of the the participants were out at other workshops or tours. 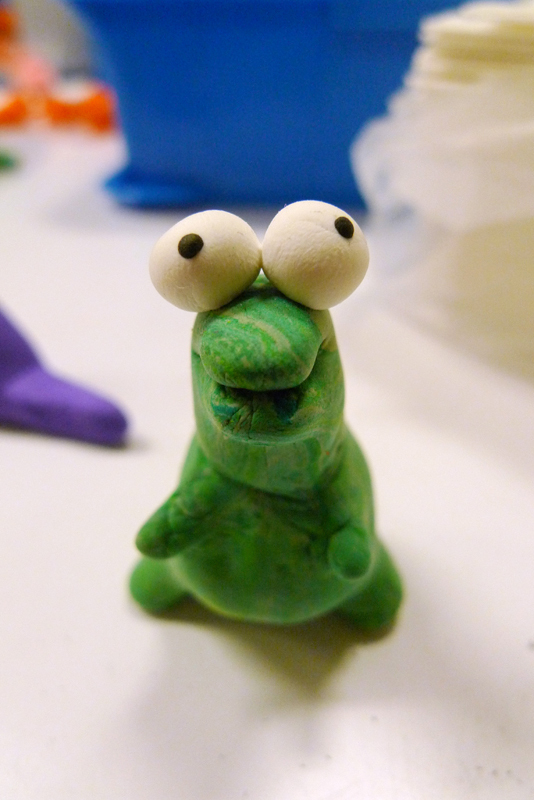 So the volunteers and I admired Chay Hoon's cute looking models made from jumping clay. Chay Hoon sure has good crafting hands. They look so cute! 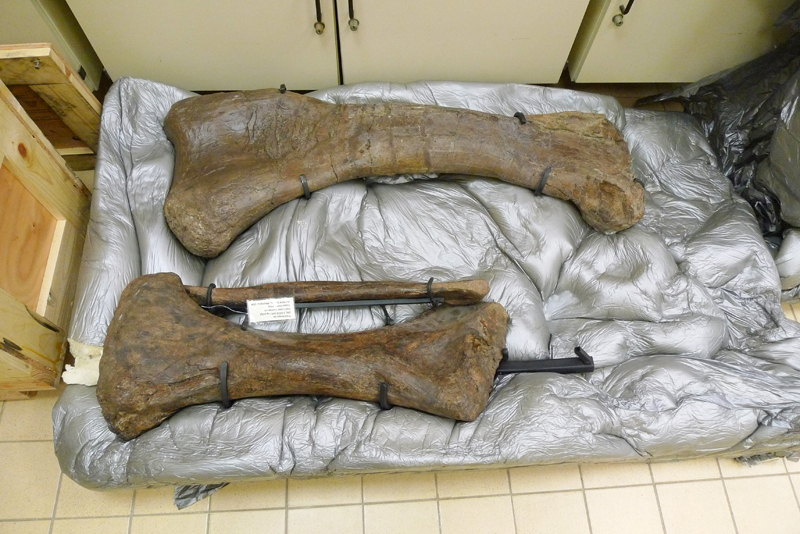 There were dinosaur samples placed on the working tables as a reference. 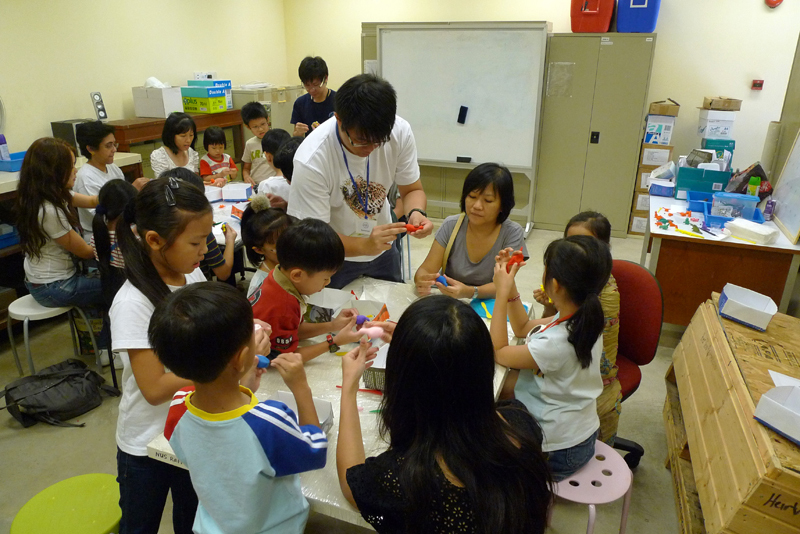 As the theme for this year's open house in on dinosaurs, the workshop did pottery on dinosaurs. 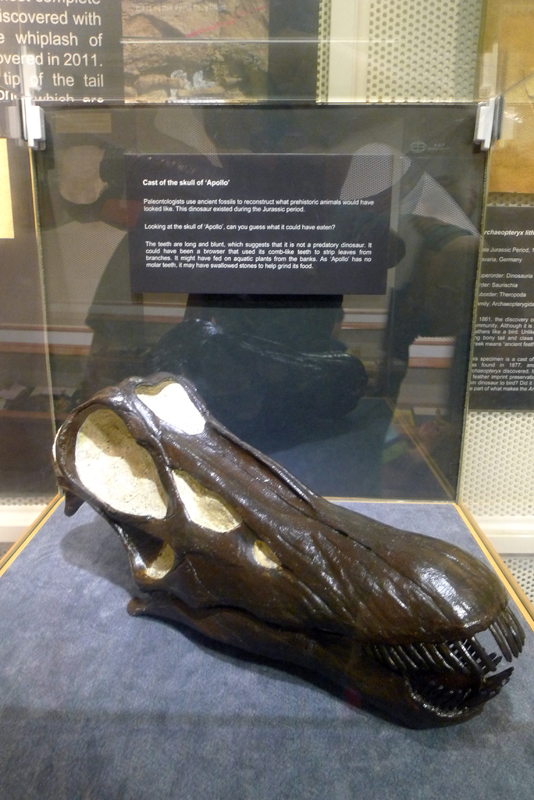 Our first dinosaur was the sauropodS. Sauropods have long necks and tails. They are herbivores. 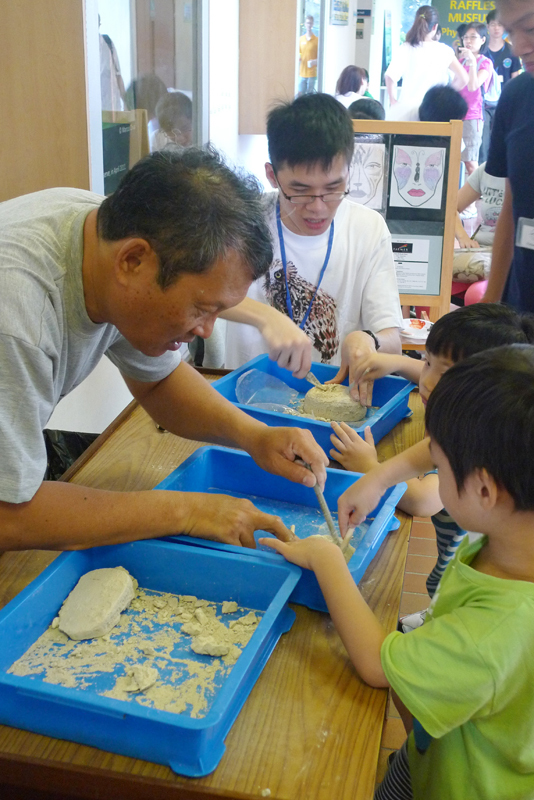 The kids really had fun kneading, pulling and shaping the clay, and then finally putting the eyes up. The second dinosaur my table did was the tyrannosaurus Rex (T-Rex). It was a difficult process to make my T-Rex look like a T-Rex. 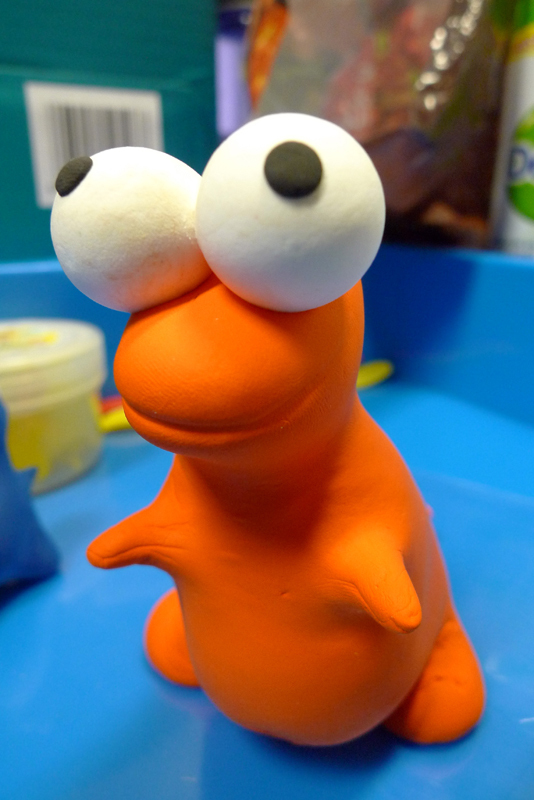 Mine turned out looking like Elmo, as what one of the mummies told me. I joking told the children at my table not to put the T-Rex with the sauropod together in the box as the sauropod will disappear by the time they get home. 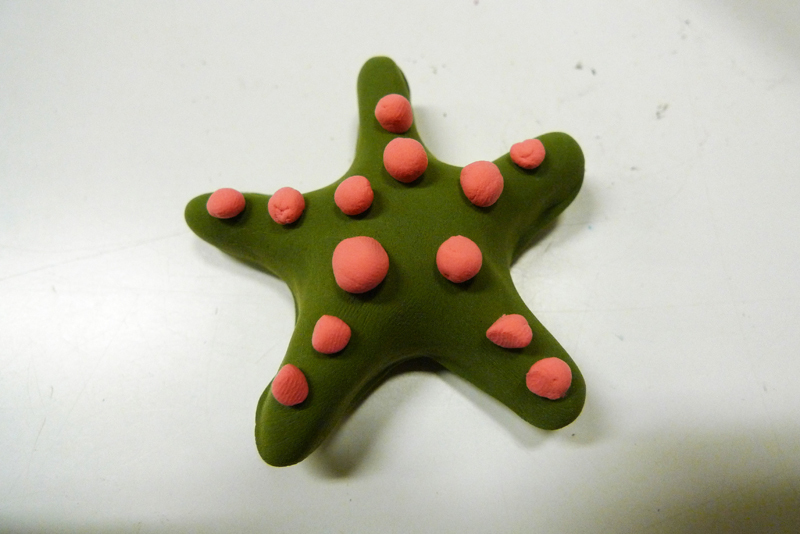 Well, the children were too busy with their clay to understand the joke. At least Chay Hoon and the volunteers understood my joke. 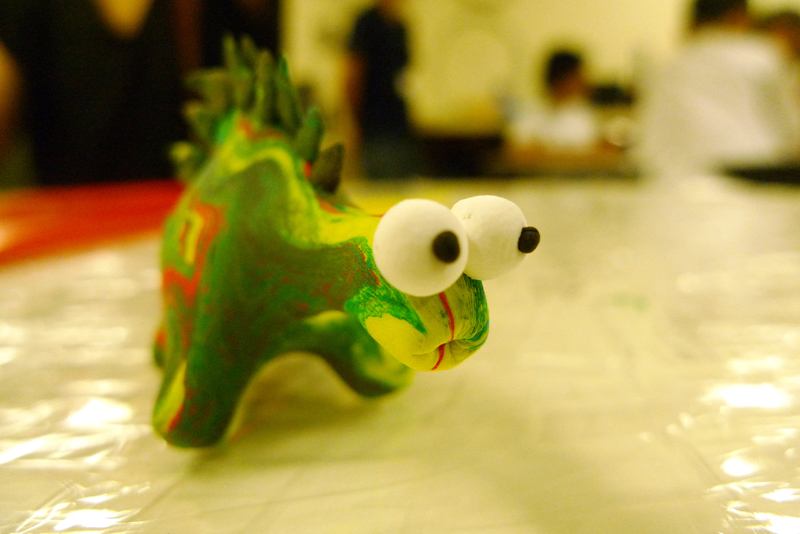 We had a lot of fun at the animal pottery workshop. The starting step in all animal pottery is always the same. 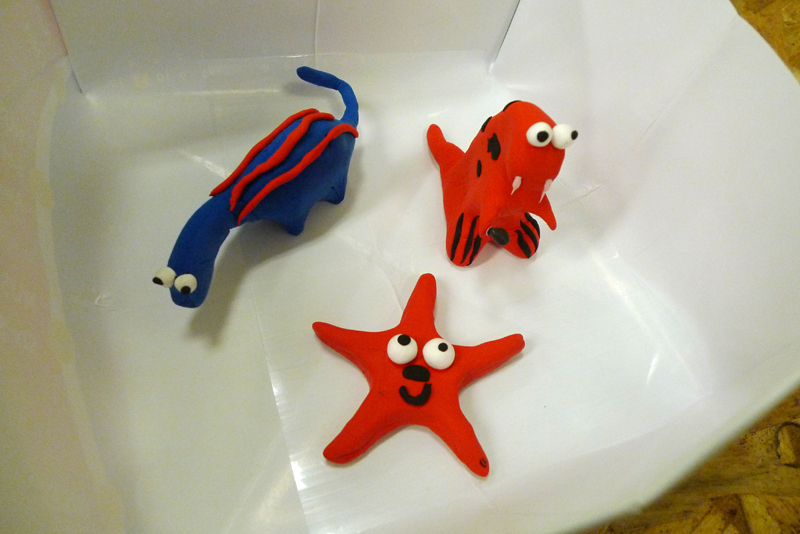 Looking my animal pottery, my end products faired no where near the expert. 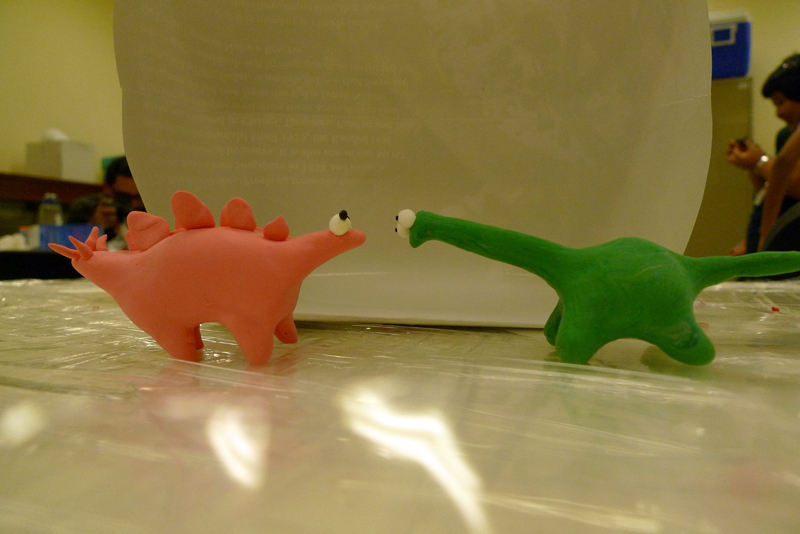 My sauropod, T-Rex and sea star. 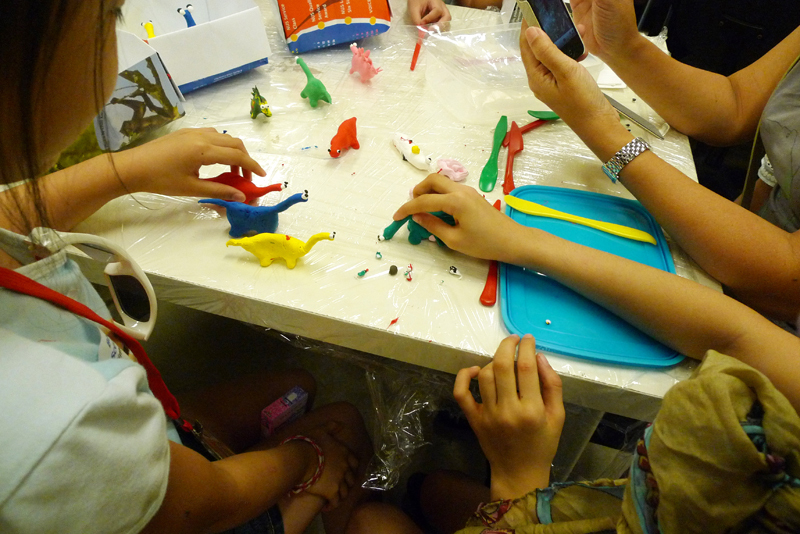 The children started playing with their dinosaurs. 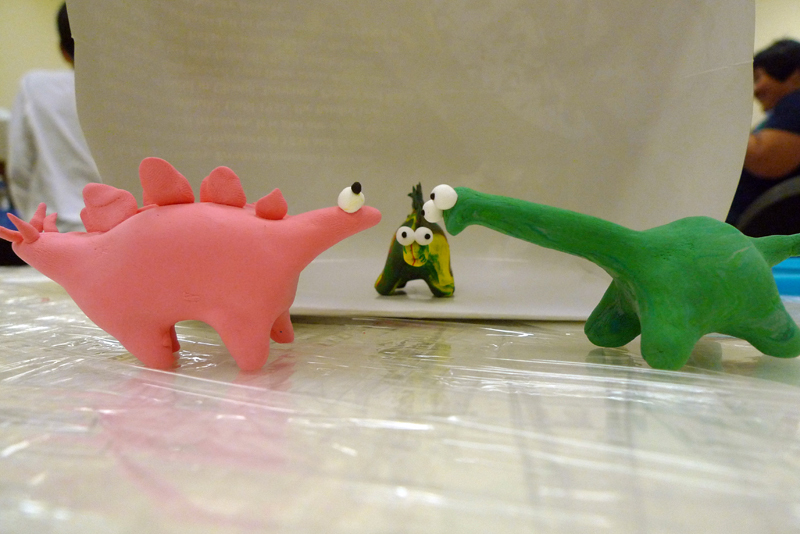 Soon the workshop came to an end and I found the sample dinosaurs on the table ended up in a staring game. The public museum was a cooling place for me to enter once in a while to avoid the scorching heat. Thankfully there were big fans placed around the corridor areas. 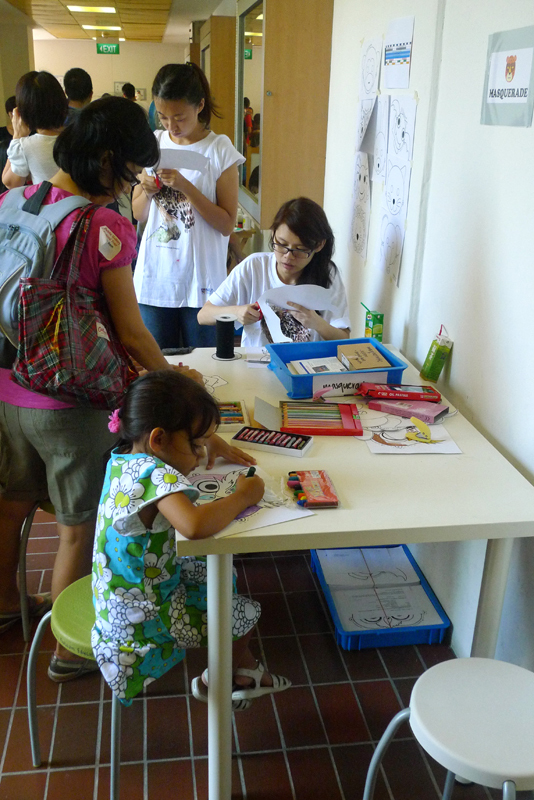 The museum was buzzing with activities as the public enters for visits, guided walk or merchandise purchases. I bought many items from the merchandise booth. 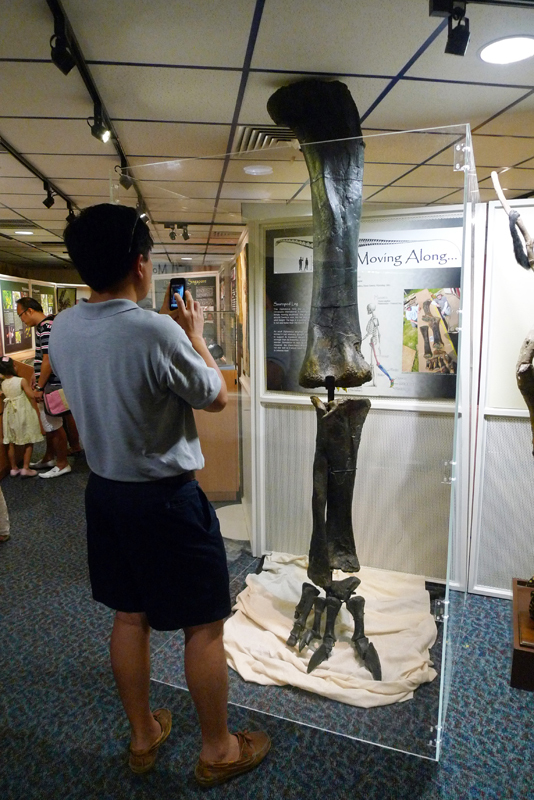 In the museum, they have put up a dinosaur exhibition and part of Twinky's leg was on display. Look at the size of the legs versus the man. This will be RMBR's last open house. They had wanted to do more open house sessions but time wasn't on their side. 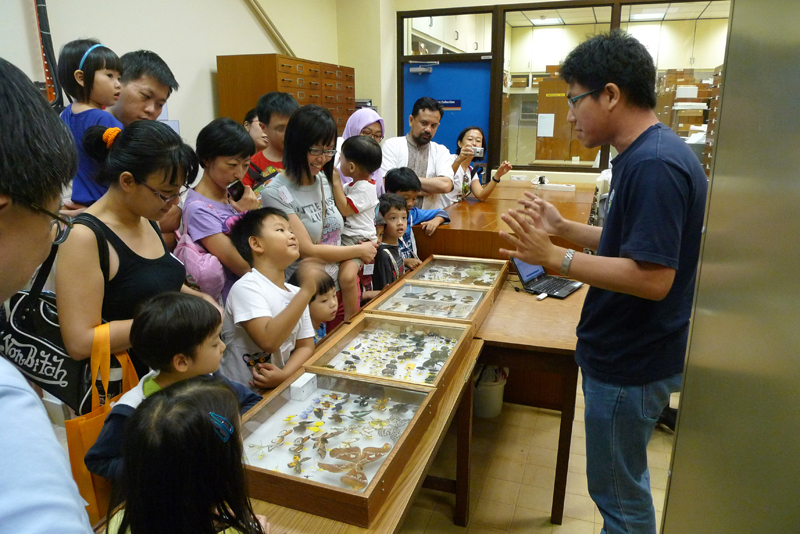 The public gallery of the Raffles Museum of Biodiversity Research will remain open till April 2013. 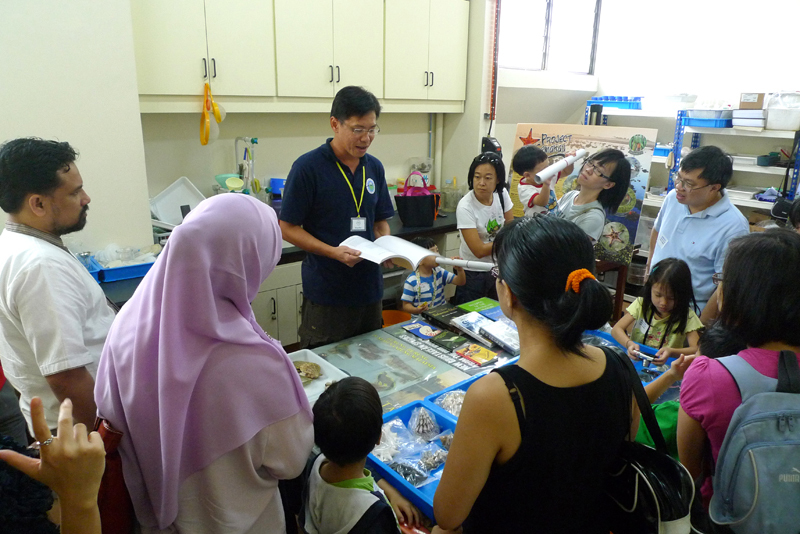 However the stored collection will be closed for inventory taking, packing and settling outstanding matters in preparation for the house moving to the Lee Kong Chian Natural History Museum, scheduled to be completed in 2014. The new natural history museum will showcase 10 times more exhibits than what we see in the current RMBR. I look forward to the new natural history museum in 2014. The snail thinks its a cat?